An ecologist takes the uniquely positive yet realistic position that we can adapt and persist despite the inevitable effects of climate change. While much of the global warming conversation rightly focuses on reducing our carbon footprint, the reality is that even if we were to immediately cease emissions, we would still face climate change into the next millennium. 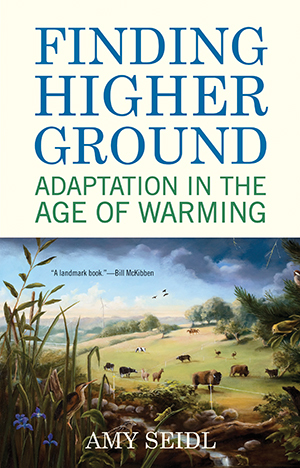 In Finding Higher Ground, Amy Seidl takes the uniquely positive yet realistic position that humans and animals can adapt and persist despite these changes. Drawing on an emerging body of scientific research, Seidl brings us stories of adaptation from the natural world and from human communities. She offers examples of how plants, insects, birds, and mammals are already adapting both behaviorally and genetically. While some species will be unable to adapt to new conditions quickly enough to survive, Seidl argues that those that do can show us how to increase our own capacity for resilience if we work to change our collective behavior. In looking at climate change as an opportunity to establish new cultural norms, Seidl inspires readers to move beyond loss and offers a refreshing call to evolve.